In a world of harsh chemicals, excess fertilization and reclaimed water on our golf courses, HUMA GRO® TURF has taken an Environmentally friendly approach to the maintenance and problem solving on your golf course. PROMAX™ is an OMRI® Listed as an Organic Nematicide and Fungicide. PROMAX™ is for the organic control of soil borne diseases and plant parasitic nematodes. OMRI® listed as an organic control of parasitic nematodes and soil borne diseases through contact activities and has systemic residual control. 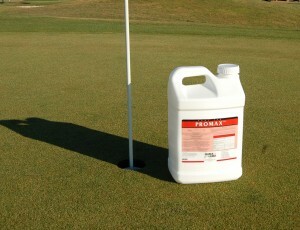 PROMAX™ works for the control of Nematodes as a cell membrane disruptor. 1- Human safety; both public and for the applicator. 3- Zero Restricted Entry Interval (REI). Spray it and play on it. 9- Compatible with most inseticides, miticides, fungicides, herbicides and fertilizers. I am the director of Huma Gro Turf. My background is over 30 year in agriculture as a grower of produce, customer accounts rep, along with growing turf. My goal in business has always been to make people and businesses as successful as possible by providing an outstanding product, service and support. Being a recreational golfer since my teenage years, along with a passion for the beauty of both the game and it's courses, I am in a field that encompasses many of my life's interests. I think the use of the organic pest control products is good for us and as well for our environment. These are environment friendly products. Great question about lawns. Pro-Max works great on residential lawns. Pet and kid safe. Pro-Max will also work great in your garden, not only for nematodes but for controlling soil borne diseases.